[Pakistan: 8th October, 2018]: Teefa in Trouble continues to break barriers for Pakistani cinema as the film was given the privilege of being selected to represent Pakistan at the prestigious Silk Road International Film Festival [SRIFF] currently underway in Fuzhou, China. This honour marks a first for a commercial Pakistani blockbuster to be invited to screen at the festival and its producer, co-writer, actor and star Ali Zafar to represent Pakistan for an open dialogue to initiate and discuss the possibility of enhancing cinematic ties between the two countries. The conference was chaired by Mr. MIAO Xiaotian, President China Film Co-Production and Mr. JIANG Ping, Vice president of China Film Group Corporation where Ali Zafar with Mr Xiaotian and Mr Ping spoke of the need for multilateral film cooperation, the burgeoning Pakistani film industry and the opportunity and potential for investment and growth and how the mutual development of film is complementary to the One Belt One Road movement. They further exchanged notes on the need for strategic reciprocal policies for film production and releases and the potential for co-produced content. 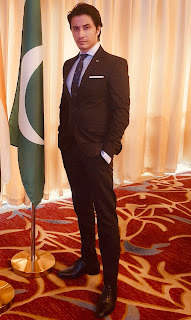 Ali Zafar was lauded by the festival and delegates for the incredible achievement of Teefa in Trouble which was privately to over 30 Chinese mainstream distributors at the festival. The film was commended for setting new benchmarks for regional cinema in terms of the production value, visual effects, cinematography, screenplay and the action sequences. Ali Zafar is now working closely with the Chinese film industry to pioneer and execute a strategic cinematic framework for films across Pakistan and China.